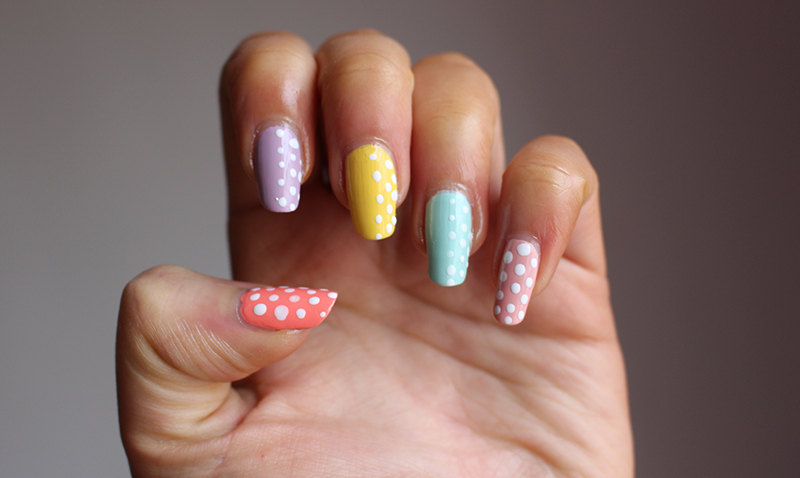 With Easter this week I thought I would share a fun nail look which anyone can achieve but is also a great way to share five beautiful pastel shades with you. This isn’t really a work appropriate nail but it’s great for anyone that is on half term from school/uni or someone that wants something a little more fun for the four-day weekend. Three of the shades were from the new S/S15 Gosh range, which is a high-shine and fast drying line made up of seven colours. I used Pretty Ballerina, French Dream and Sunkissed which all applied well with two/three coats which is pretty standard from a pastel polish but dried very quickly too (I also used Snow White for the dots). At only £3.99 they are a great option if you are looking for affordable polishes. Quality wise I really love the Nails Inc Gel Effect polishes (Nails Inc have some truly beautiful new shades which I will hopefully share soon!) and although they are more expensive they are worth the extra ££, especially if it is a shade you will get lots of wear from. The pigmentation is excellent requiring only two thin coats but the high-shine is really comparable to that of a gel manicure. I used the shade Seven Dials which although isn’t to everyones taste I find really brightens up the other colours. With Halloween only 11 days away I thought I would share the first of my two Halloween nail posts. 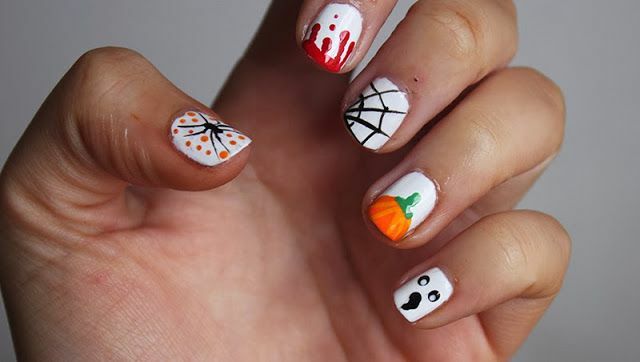 Although I don’t like nail art anywhere near as much as I once did, I still think it’s a must for both Halloween and Christmas. A few years ago I shared my blood nails on Instagram and they’re still my favourite as there is simply no other time of the year where I would wear it. However if you are looking for something a little more fun I shared five different nail art ideas last year (here) and that I still love. Of course you don’t have to do it exactly the same- you can go for one of my designs on all five nails, pick just a few or mix and match some of your own with my ideas too. 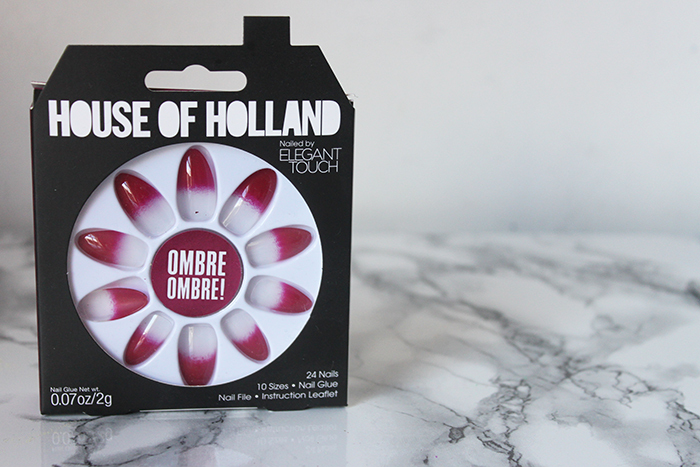 If nail art is just a little too much, I am currently in love with these House of Holland (By Elegant Touch) Press-on nails which are just perfect! They’re really easy to apply, look incredible and from my experience last quite a while too. I’m hoping to wear them at some point this week and will share a photo of them next week along with some other halloween inspired nail colours. 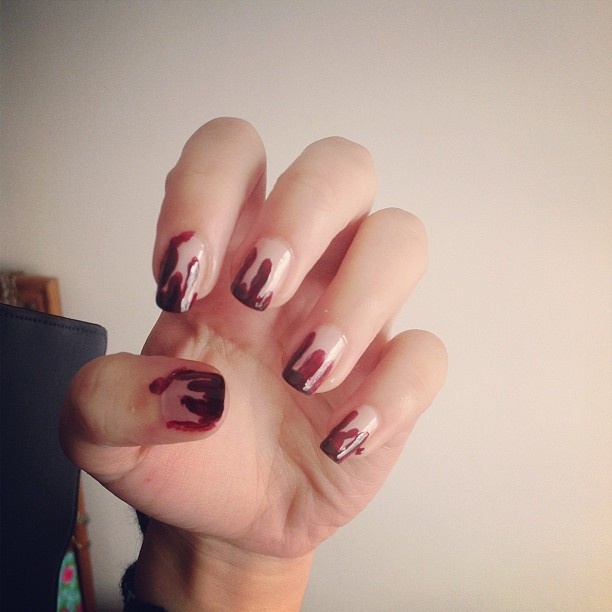 What will you be wearing on your nails this Halloween? Forever 21 and Models Own have teamed up to create a collection of polishes and a few beauty items to be sold worldwide in Forever 21 stores. The collection is designed for every girl that wants to add an extra kick to her wardrobe and look. 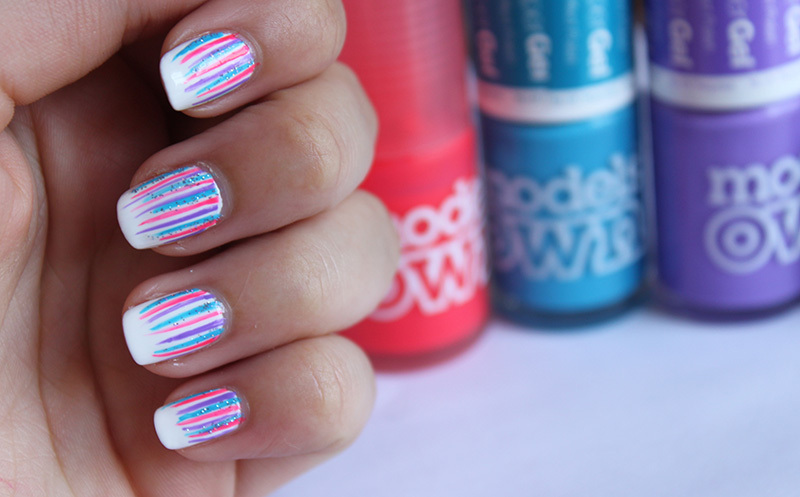 It’s made up of neons, pastels and neutrals which will transform not only nails but lips and eyes! (Shorts, Sunglasses, Necklace, rings. bracelets: All forever 21 // Nail Polishes: Models Own. 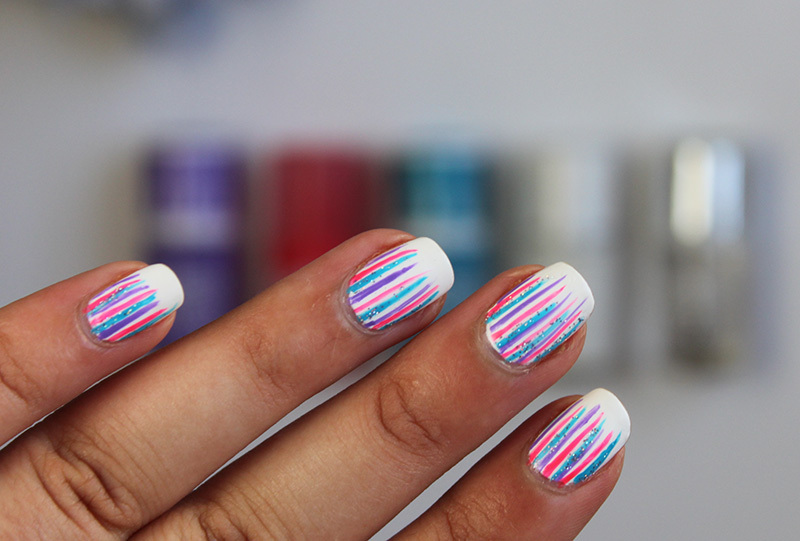 As soon as summer hits I like to have a little fun with my nails which is why I decided to take a little inspiration from Nailasaurus and create this waterfall nail art which is actually quite easy to do. 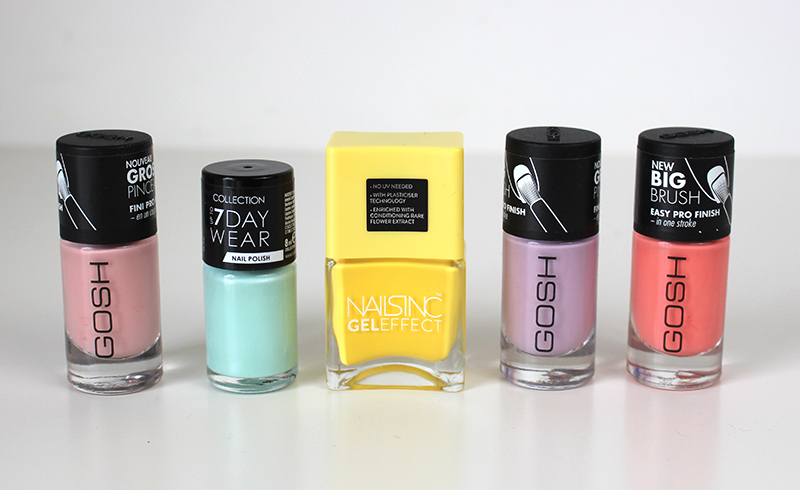 I wanted to use a range of neutrals, neons and simply couldn’t resist the gel formulas. 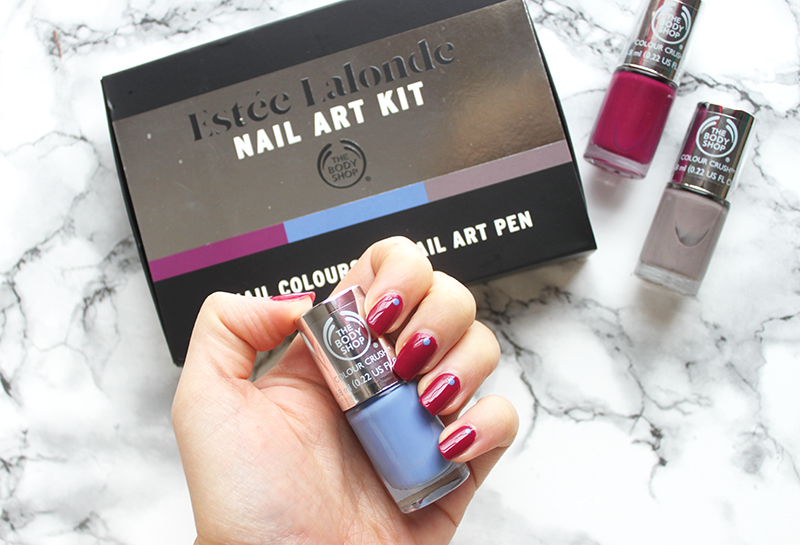 Supplies: Your favourite base coat, a selection of Models Own Nail polishes and a nail brush. (You can use a thin paint brush or a nail brush which you can find in beauty stores or just clean one off from a nail art polish you own, I used the Models Own one). The colours I went for are White Light, Blue Glint and Purple Gluro from the HyperGel Range and Pink Punch which is am amazing neon! Step 1: Chose the colours you want to go for, which one will be your base colour and which will be used to add the details. 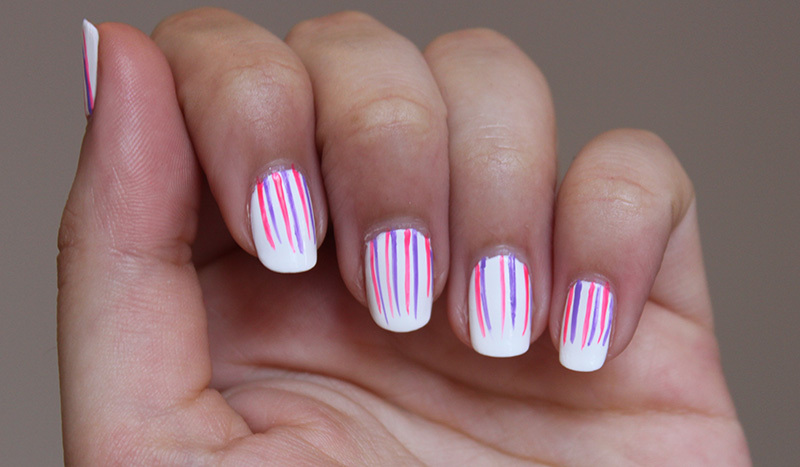 Step 2: Once you have filled the nails apply a base coat and two layers of your base colour. I went for the Models Own Hyper Gel White Light as it’s one of my favourite polishes at the moment and can really enhance a tan. Step 4: Paint the next two or three colours in the same way you did your first one. I also added a little glitter but that’s optional. Step 5: Use the Models Own Erase Corrector Pen to clean up the cuticle area. 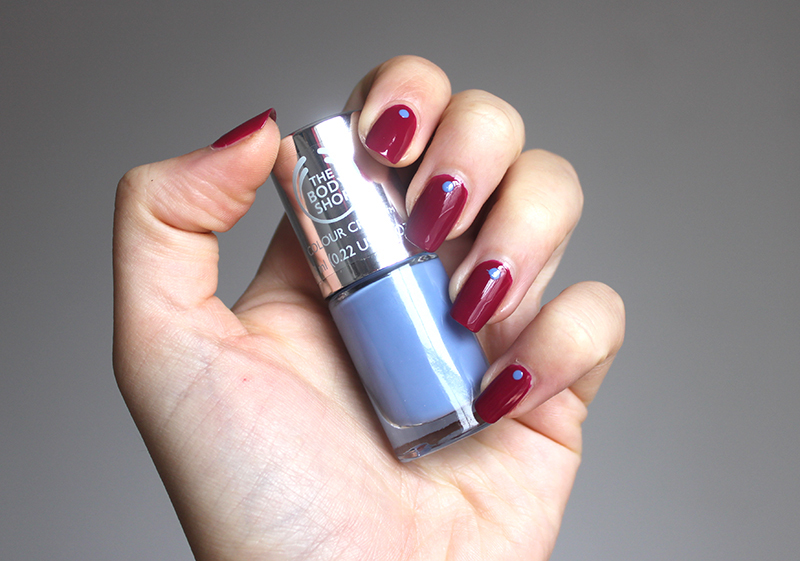 Step 6: Finish With Models Own HyperGel Top Coat for a glossy long lasting finish. 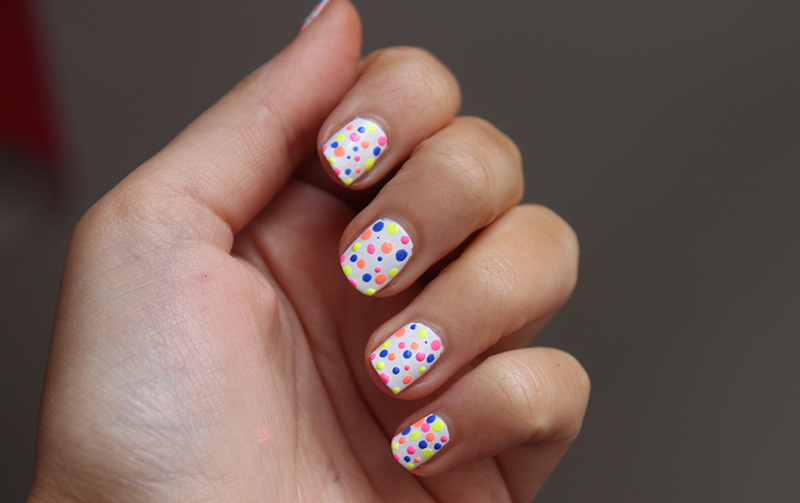 What current favourite nail art design to brighten up your summer outfits? Earlier in the week I decided I wanted my nails to be fun and bright for the spring/Easter but I didn’t want anything too difficult. Of course it had to include the Models Own Polish For Tan as I am currently in love with all the shades and I went for simple dots simply to make life easy for myself but I still love the results! I started with my favourite white which is by Morgan Taylor as it opaque and streak-free in just two coats. I reached for Model’s Own Sun Hat, Beach Bag and Bikini (swatches and review here) but felt I wanted a less neon colour to contrast so decided on Diego Dalla Palma in Night Blue which is beautiful bright royal blue. 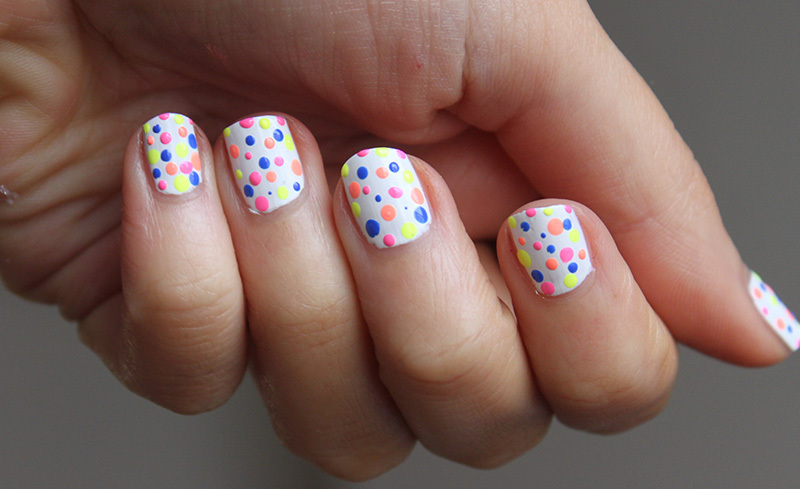 I used the Bourjois Dotting tool and tried to very the size of the dots. I’m really happy with the finished results; they’re bright and fun but not too in your face (in my opinion, of course). 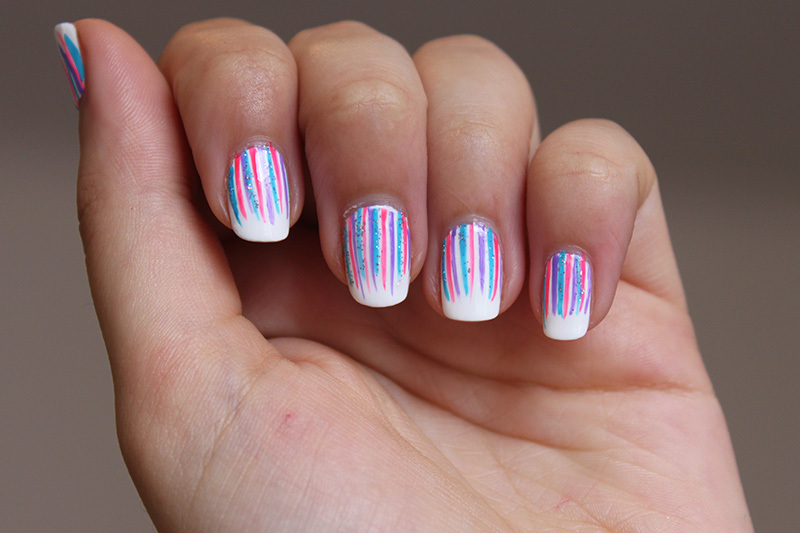 What do you think of these nails? 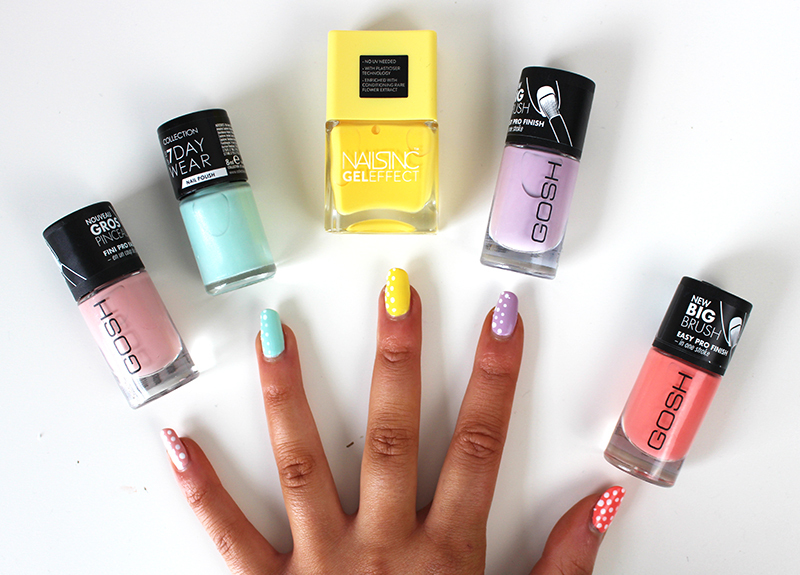 Have you tried any Spring/Easter inspired nail art?